Transitioning academically underperforming students from high school to post-secondary education is difficult and requires wrap around support, before and after graduation. A Central Virginia alternative school struggled to bring the right partners on board to ensure their graduates received a fair shot at college or open jobs in their community. Cities Reimagined joined forces with the alternative school to create a plan that would create one, cohesive process for these students to receive the support they needed from the time they entered high school to the time they enrolled in post-secondary education or applied for their first full-time job. Cities Reimagined began the process of plotting the course by hosting a rapid prototyping workshop. The alternative school's design team was a scrappy group of five: an economic developer, two educators, a founder director, and the director of a local non-profit. 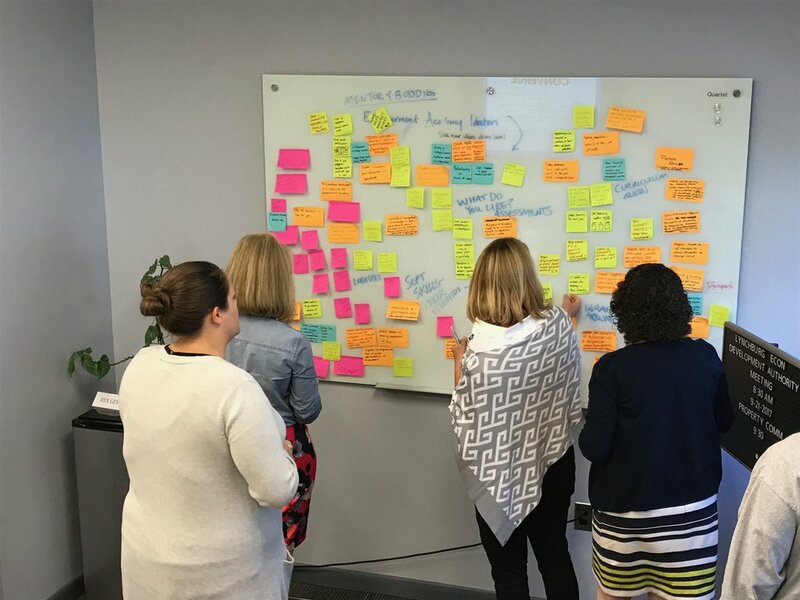 With 90 minutes on the clock, the team went to work to put all of their ideas on the board, group them into process categories, and begin placing them down into a storyboard. The team had 20 minutes to write or sketch any ideas that answered the problem question: "Students need a bridge to full time employment after graduation. How can we place students in middle / high skill jobs?" At the end of ideation, the team converged for 20 minutes to sort their ideas into categories. Themes like mentoring, transportation, curriculum, and interest profiles emerged from this exercise. Converging allowed the team to wrap their minds around the scope of ideas on the board and begin to make sense of them before moving on to prototyping. The remainder of the 90 minute workshop was spent prototyping a process for transitioning students from high school to middle and high skill, full-time employment. Prototyping can take the form of a physical object, a role-play or a storyboard. In this case, the design team opted to create a storyboard which they believed best reflected their ideas for a program. At the conclusion of the workshop, the design team walked away with a prototype that they can now shop around to students, non-profit partners, and potential funders. Based on the feedback of these stakeholders, the team will modify the prototype to meet the needs of each user group. Pieces of the storyboard were delegated to members of the design team to move forward on, giving everyone a clear role and next steps to move the ball forward.